Chair of the Royal Commission, Justice McClellan has publicly declared his disappointment at the Commonwealth Government’s refusal to support a national redress scheme for survivors of institutional child abuse. The Commonwealth were invited to present their submissions on this issue during this week’s public hearing however the invitation was refused. In their submissions, the government said that administering a national scheme would require too much time and resource. All the while, the same government continues to invest hundreds of millions of dollars running a timely and resource-heavy Royal Commission whose job it is to advise the government on how survivors should be compensated. The Commonwealth Government is receiving criticism from all sides after their submissions to the Royal Commission on the issue of redress for victims of child abuse in institutions. Back in January the Royal Commission released a detailed consultation paper outlining their suggested recommendation for a national redress scheme to compensation survivors of abuse. The Royal Commission sought submissions from governments, institutions, interest groups and individuals. Submissions were received from over 250 organisations and individuals, including all Australian governments, except for Queensland and the ACT. The participating States and Territories expressed varying opinions on a national redress scheme. Both Tasmania and South Australia opposed the idea, preferring instead to reform their existing State-run compensation schemes. However, New South Wales, the Northern Territory and Victoria have responded positively and are open to negotiations. The greatest upset has been in response to the brief and forthright submissions filed by the Commonwealth Government, in which it was made clear that they did not endorse a national redress scheme. Survivors, advocacy groups and even the Catholic Church have expressed their surprise, disappointment and in some cases, outrage at the Commonwealth’s stance. In a public statement, Chair of the Royal Commission, Justice McClellan has said that he is “disappointed” at the Commonwealth government, particularly as the Royal Commission’s Terms of Reference indicate an agreement among all Australian governments that ‘justice for victims’ requires appropriate redress. A national scheme, administered by the Commonwealth and majority funded by responsible institutions has received support from survivors, advocacy groups and large institutions, such as the Catholic Church. 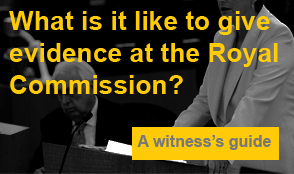 This week the Royal Commission is holding a public hearing. A number of government and non-government organisations were invited to speak from their submissions and answer questions from the Commissioners. All Australian governments were invited to speak, however only Tasmania, South Australia and Victoria accepted the invite. On the other hand, numerous non-government organisations accepted the opportunity to present their submissions, with some individuals travelling from the other side of the globe especially for this occasion. In its written submissions, the Commonwealth focused on the significant time and resources that would be required to administer a redress scheme at a national level. This appears to be a strange objection when the government has already spent hundreds of millions of dollars establishing and running a Royal Commission, tasked with the very job of determining how the government should respond to this national problem. Click here to read all the published submissions of the organisations invited to speak at this week’s hearing.